Freedman, Russell (1998). Martha Graham: A Dancer's Life. NYC: Clarion Books. ISBN 0-39-574655-8. Horosko, Marian (2002). 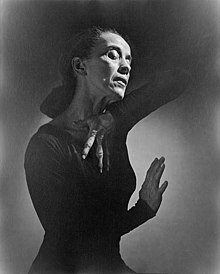 Martha Graham: The Evolution of Her Dance Theory and Training. Gainesville, FL: Univ. Press of Florida. ISBN 0-81-302473-0. Morgan, Barbara (1980). Martha Graham: Sixteen Dances in Photographs. Morgan & Morgan. ISBN 0-87-100176-4. Tracy, Robert (1997). Goddess - Martha Graham's Dancers Remember. Pompton Plains, NJ: Limelight Editions. ISBN 0-87-910086-9. Bird, Dorothy; Greenberg, Joyce (2002 reprint). Bird's Eye View: Dancing With Martha Graham and on Broadway. Pittsburgh, PA: Univ. of Pittsburgh Press. ISBN 0-82-295791-4. Taylor, Paul (1987). Private Domain: An Autobiography. NYC: Knopf. ISBN 0-39-451683-4. Soares, Janet Mansfield (1992). Louis Horst: Musician in a Dancer's World. Durham, NC: Duke University Press. ISBN 0-82-231226-3. Hawkins, Erick (1992). The Body Is a Clear Place and Other Statements on Dance. Hightstown, NJ: Princeton Book Co. ISBN 0-87-127166-4.